The main Muslim festivals are Eid and Muharram. From time to time folk culture has influenced these festivals, as a result of which the original religious practices have changed. 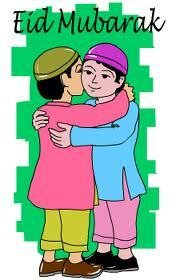 Eid consists of Eid-ul-Fitr and Eid-ul-­Azha. Eid-ul-Fitr is observed after the end of the month of Ramadan. The social meaning of Eid is a joyful festival, while its etymological meaning demotes returning lime and again. Like all other social festivals, Eid returns every year. Same is the case with Eid-ul-Azha. The celebration of those two festivals in the early period was influenced by the folk belief of the peasants. Later on, a few other religious practices and customs were added. One of the main features of the Eid festival is the preparation of special food an drink. The food would include korma, pilau and various types of homemade pitha, semai and jarda. One of the main characteristic features of Eid in the nineteenth century Dhaka was the Eid procession. Probably the Naib-Nazims of Dhaka introduced this practice after taking the cue from the famous Janmastami procession of Dhaka. After being stopped for some time, such processions were again revived a few years ago. In many cases, local or urban culture has also made an impact on this festival. The main feature of Eid-ul-Azha is the sacrifice of animals, especially cows and oxen. Many people in the villages sacrifice domestically raised cows or goats. The majority of the professionals in towns sacrifice cows on a share basis. The well to do sacrifice cows or goats or both animals on their own. Eid for the common people means meeting family members and friends, buying new clothes and preparing delicious food on the Eid day. Hoseni Dalan, also spelt Husaini Dalan, is a Shia shrine in the old part of the Dhaka, Bangladesh. It was built in the 17th century AD during the Mughal Period. This shrine comme­morates the martyrdom of Imam AI­ Husain (R), grandson of Hazrat Mohammed (SM), during the battle of Karbala on 10 October 680 AD. Although the Sunni sect is in the majority in Bangladesh, there is a small number of Muslims belonging to the Shia sect in Dhaka. During the first 10 days of Muharram, it becomes a centre of mourning and religious celebration in old Dhaka. Both the Sunni and the Shia followers join the mourning, ending in the festival of Ashura when a great procession parades through the city streets. At present, Muharram is observed in the remote areas of the districts of Dhaka, Manikganj and Tangail in a somewhat different fashion. In some houses of different locations, Muharram is observed according to the folk customs centering on saints and fakirs, which have continued on the basis of regular line of descent.